Tameside Health visiting teams & Local Children’s Centres continue to provide gold standard care and have been awarded the prestigious Baby Friendly Award. They are the latest UK health care facility to win international recognition from UNICEF (United Nation’s Children’s Fund). The Award was will be recognised nationally at the UNICEF Baby Friendly Conference, in Telford, this month. “We decided to join forces with UNICEF UK’s Baby Friendly Initiative to increase breastfeeding rates and to improve care for all mothers in Tameside, said local Infant Feeding Coordinator, Fiona Munro-Muotune. “Breastfeeding protects babies against a wide range of serious illnesses including gastroenteritis and respiratory infections in infancy as well as asthma, cardiovascular disease and diabetes in later life. We also know that breastfeeding reduces the mother’s risk of some cancers – although mums might be more interested in hearing that it is easier, cheaper and simply less hassle than bottle feeding,” added Fiona. 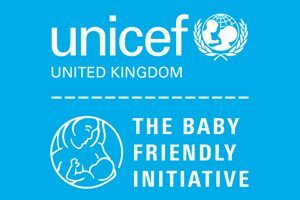 The Baby Friendly Initiative, set up by UNICEF and the World Health Organisation, is a global programme which provides a practical and effective way for health services to improve the care provided for all mothers and babies. In the UK, the initiative works with UK public services to protect, promote, and support breastfeeding and to strengthen mother-baby and family relationships. Support for these relationships is important for all babies, not only those who are breastfed. The Award is given to health facilities after an assessment by a UNICEF team has shown that recognised best practice standards are in place.